With not too much fanfare, December saw the Mars Express mission operations team at ESOC bringing the VMC back online, again. You'll recall that VMC went offline in late 2011 when Mars Express suffered problems with the mass memory storage. The spacecraft and instruments were fully back in routine operation by January 2012, meaning that the team could then devote some 'time-available' time to recommissioning VMC. In addition to getting the camera itself running (marked by the first symbolic data transmission of a VMC image via Malargüe station), we also set up a new blog channel and a dedicated Flickr page to host the images (and the Twitter account – @esamarswebcam – is still running). Over at the Planetary Society blog, Emily Lakdawalla posted an update explaining the return of the VMC and including comments from Daniel Lakey, one of our MEX engineers looking after VMC. 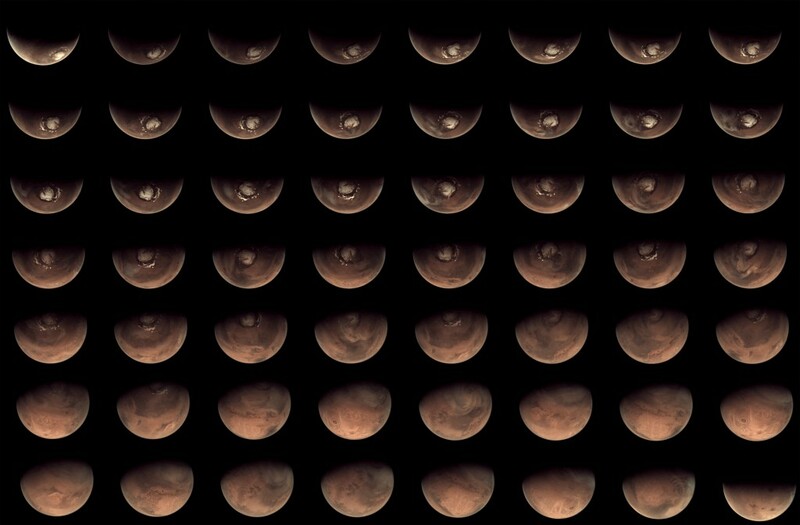 There's little improving on her excellent report, so with no further ado, please (a) take a look at her gorgeous collage '56 views of Mars from the Mars Webcam in 2012' reproduced below, and (b) head over to her blog and read her update in full. Following the first downlink over Malargüe tonight, we will consider the Flickr page to be open for business. Unfortunately, due to the upcoming solar conjunction and associated low bit-rate season, we're unlikely to get any downlink slots for VMC for a few months, but once the Mars Webcam is taking pictures again, the images will be published for the world to see within seconds of them being received on Earth. The low priority of VMC images means that their downlink to Earth can be some time after the observation.